Free Verbal Appraisals & Evaluations – The Treasure Traders, Inc. If you are considering selling us your heirlooms, treasures or personal property outright, or through one of our online auctions and or consigning to our estate liquidation gallery we will provide a free confidential verbal appraisal and evaluation without a formal written appraisal. Buccaneer Trading Specializes in a wide range of catagories including Jewelry, Watches, Coins, Precious Metals, Diamonds, Antiques, Collectibles, Designer Handbags, Luxury Accessories, All Personal Property and General Estate Merchandise Including Automobiles, Boats, Motorcycles, Real Estate and More. Our Appraisal Service Department will work with you to determine the proper form of appraisal and endeavor to meet any special requirements set by the client, whether that be an individual, executor, P.O.A. or any other professional advisor. TheThe Treasure Traders provide FREE Verbal Appraisals, Fair Market Value Evaluations and Replacement Cost Appraisals for the following situations. 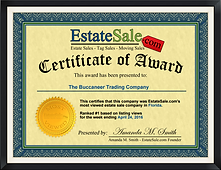 Selling your Jewelry, coins, antiques, collectibles and family heirlooms with The Treasure Traders guarantees trusted service, honest fair pricing and a successful sale. From outright purchases, pre sale evaluations, moving arrangements, security, and national advertising to catalog preparation, gallery exhibition, presentation, and an itemized accounting, you’ll receive the maximum value for your items, collections or estate. The first step to selling is estimating the value of your property. A Buccaneer Trading representative will provide you with an idea of its market value and salability. Supported by our data base, our appraisers have knowledge, expertise and experience in the judgment of an item’s market value and selling points.